EPHRATA - When the discussion first started about nominating the Port of Ephrata for Port of the Year, Manager Mike Wren was hesitant. "We've had a fantastic year here, and in fact I hear a lot of, 'Wow, we've never seen this sort of stuff happen here before,' he said. "But, you know, a lot of ports in Grant County have done real well, Grant County's doing real well. I thought, 'How do we compete with guys like Port of Tacoma, Port of Seattle and Vancouver and all that?'" But the port district's commissioners - Everett Wenke, Karen Moore and Bob Criss - persevered. "Our commissioners said, 'We've got a great story to tell and the people around here deserve to share in our success,'" Wren said. "The people that came before us worked long and hard to get the infrastructure there so we were ready to move," Wenke said. "Things finally hit the gel point where people started coming." Wenke said the port district is set to grow, and growing with the aid of help and partnerships with other people. "Consequently, last year was a very good year for us, as far as growth goes," he said. Amongst the port's successes, Wenke pointed to bringing in Katana Industries, partnering with the city, Grant County and the state to build a road connecting the port to the main highway to cut down on truck traffic through schools, partnering with the Federal Aviation Administration to build a new runway for gliders and partnering with the state to refurbish the port's rail line. "We're in a growing mode, we're getting more infrastructure and we continue to hope to grow," he said. So Wren submitted the nomination form for the Washington Public Ports Association Port of the Year Award in September. "When you put it in perspective, what's occurred for the size of the community, for the amount of tax dollars brought in, all those sorts of things, when you start putting it into ratio perspective, it's pretty awesome," Wren said. "After I sat down and went through that, I thought, 'Wow, we have done very, very well.'" The association called to inform Wren in October the port had won the award. The port attended a ceremony Nov. 16 in Bellevue. "We are just really excited for the citizens of Ephrata to be honored like this," Moore said. "Tremendous things are happening out there, and with the new infrastructure. There's been a lot of years of building out at the port and it's finally all coming together. All the ports around the state are working very hard for economic development and to be singled out is a real honor." "It really comes back to the whole issue of partnerships and how successful we've worked together as the region, because it starts all the way from here to the city to the county to the state," Wren said. "It really comes down to how successful and focused we've been on building partnerships and doing things together we can't do alone." The Ephrata port shares the honors with the Port of Benton. "They couldn't sort it out between the two of us," Wren said. "So this is the second time, I think in the history of the award, that two ports have been awarded it." If anything, Wren thinks the award proves the money taxpayers provided during the port's dry years was worth it. "Some days, you've just got to be patient, hang in there and ultimately it will produce for you," he said. "I think it will continue to produce, so I think the only thing it really does for us is to say, 'Hey, we've all worked together and we're doing it right and it's productive.'" Wren anticipates providing further support for Katana Industries. Originally slated to bring 110 to 120 jobs, the company is now at 160 and could easily reach 200 if able to find the employees, he said. The stretch of road between Katana and a rail spur needs to be asphalt, he said. "That's kind of my project for the winter, is to figure out how to again pull that money together from as many places as we can," Wren said, estimating $300,000 needs to be raised. "As a port we stay committed to economic development in our area, and I believe the groundwork is in place to accommodate future development," Criss said. "A lot of the things that are in place now, we hope will lead to future projects." 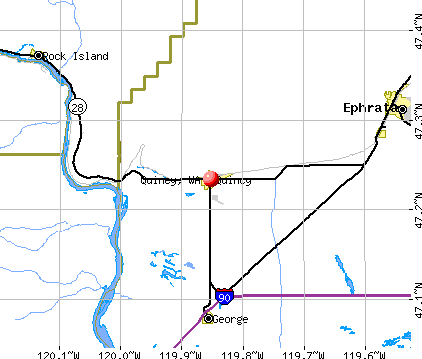 Ephrata is a city in Grant County, Washington, United States. The population was 6,808 at the 2000 census. It is the county seat of Grant County6. Ephrata was officially incorporated on June 21, 1909. Historically, the settlement of Ephrata is quite recent. There was no known settlement until 1886, just three years before Washington attained statehood. The horse rancher, Frank Beezley, was the first to settle near the natural springs, thus the area was known as Beezley Springs. As the climate and topography were not promising to settlement, the entire region remained sparsely populated until several federal congressional actions, including the Northern Pacific Land Grant Act, the Homestead Act and Desert Claims Act, encouraged the settlement of this semi-arid desert. Originally, Douglas County spread over the entire territory of the Big Bend of the Columbia River. In 1906 the Washington State legislature divided the county and created Grant County, designating Ephrata as the county seat. It is generally believed that the city was named Ephrata by a man who worked for the Great Northern Railroad. The name Ephrata is derived from a biblical description of an orchard in the middle of the desert. It is also the ancient name for the town of Bethlehem. Beginning in July of 1918, several prominent Ephrata residents started the promotion of a wild scheme to redirect waters of the Columbia River in order to irrigate the dry but fertile soils of the Big Bend country. Labeled "The Dam University", Ephrata residents persistently lobbied at the local, state, and federal levels to gather support for the project. Initial funding for the Grand Coulee Dam was through the Public Works Administration created under Franklin Roosevelt's promise of a "New Deal" in 1933. However, the irrigation waters would not be released as the nation focused on ending World War II during the 1940's. During this era, Grand Coulee Dam's main mission was to produce electrical energy for the Hanford Reservation. When the War ended, the Project returned to its original mission, to irrigate the desert. 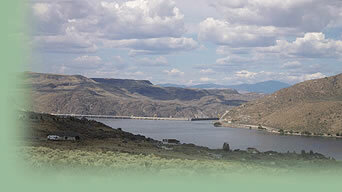 The Columbia Basin Irrigation Project changed the landscape and the economy. Since 1951 when the first irrigation waters arrived, the Project has expanded to irrigate over 600,000 acres (2,400 km-square). Over 60 different types of crops are now produced from Project lands, including many seed crops, making the Columbia Basin a vital component in world-wide food production. In the 1940's, subsequent federal projects continued to impact the region. An Army Air Base was activated at the Ephrata Airport between 1942 and 1945. The US Army established an even larger Air Base north of Moses Lake and about 15 miles southeast of Ephrata. Although Moses Lake became the major service center for the Larson Army Air Base, Ephrata experienced spill-over population growth. The construction of the Irrigation Project and the military activity increased the population of Ephrata 689% between 1940 and 1960. As the federal projects phased out, the town experienced a devastating population decrease of 22% between 1960 and 1975. The population stabilized between 1975 and 1982, with a slight decrease between 1980 and 1990. The city has seen steady population growth since 1990. The present population is 6895. Three factors are expected to greatly affect future growth projections in Ephrata. First, Ephrata remains a desirable bedroom community to the neighboring communities. Good schools, low crime, aesthetically appealing downtown, close central proximity to the major retail center of Moses Lake, and comparatively low cost of living, contribute to making this a community of choice. As the industrial base in neighboring communities continues to grow and prosper, so shall Ephrata's new housing starts and consequent population. Second, there has been a sharp increase in new housing unit building permits issued by the City since 1990 and particularly since 1993. Forty-one residential permits were issued in 1993 and sixty-one in 1994; 1995 permits issued for new housing units numbered 94, of which 39 were manufactured homes. This compares with a low of three permits for the entire year of 1988. This surge in new home construction implies a growth rate exceeding the previous decade's growth. Projections indicate that Ephrata will continue to see a 3% per year increase in population. A third factor that could greatly affect population and general economic growth in Ephrata is the development of the Port of Ephrata. With over 2,000 acres (8 km square) of industrial and commercially zoned land, the Port Authority is the largest single landholder within the City of Ephrata corporate limits. Development on the port property has been limited due to the lack of infrastructure and buildings. The Port recently developed property for the first time in over 40 years. Grant County Public Works is building a 42,000 sq ft building. The development provided for three additional lots that have available water and sewer.